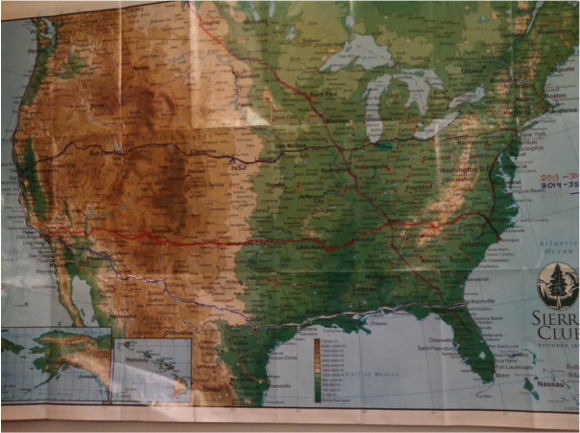 For the last three years, Racery cyclist Sarah Tacker has been tracking her cumulative mileage using a physical map on her office wall. The upside: “a vi sual on the wall is a good conversation piece,” says Tacker, who is a programmer at SAS in Cary, North Carolina. The downside: it’s a lot of work. With an annual goal of 4,000 miles, Tacker has traveled virtually along the nation’s major highways, including I-40, I-85 and the Pacific Coast Highway. Armed with a sharpie and a ruler and using a separate whiteboard for the tally, Tacker traced her daily progress in increments, highlighting daily progress along the chosen route. Search engines yielded no answers. But a friend at SAS who runs told Tacker about Racery’s virtual race platform, which allows runners, cyclists, swimmers and rowers to compete with one another while seeing their progress automatically plotted in real-time on a virtual route. (SAS employees have participated in a number of Racery’s virtual competitions including the Triangle Tech Challenge and a fundraising race benefitting TechGirlz). Since January, Tacker has logged almost 3,500 miles on a custom Racery route averaging 115 miles per week. Racing from Walt Disney World in Florida to Denali National Park in Alaska, @Sarah2.0 is already 73% of the way through. She picked the 4,600-mile route because she thought it would push her to surpass her 4,000-mile goal. There’s a big bonus, too, versus her paper map: “Now I have friends doing it with me!” says Tacker. Tacker recruited nine other racers from a group of local cyclists she bikes with in real life. The group uses Racery to keep in touch, when not physically together for rides and high fives. Want to launch your own custom race for a group of friends or coworkers? Fill out this form to get started.